Dr. Al Sayed completed his M.B.B.CH in 1980 from Faculty of Medicine, Ain Shams University, Cairo, Egypt. He has a Diploma in Paediatrics from Zagazig University, Egypt completed in 1991. Dr. Al Sayed Kamal has an excellent and impressive track record of over 34 years in ER, Internal Medical Department, ICU and Cardiology Department. He specialises in Emergency medicine, Internal medicine, ICU and Cardiology Department. 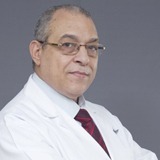 He has worked as General Practitioner in numerous hospitals of international repute like Ain Shams University – Cairo, Egypt, Armed Force Hospital, Egypt and MOH Hospitals, Egypt . He manages diagnosis and treatment of hypertension, diabetes, dyslipidemia, thyroid diseases, upper and lower respiratory disease, liver disease, diagnosis and treatment of internal medicine diseases, diagnosis and treatment of allergic and asthma diseases, diagnosis and treatment of cardiovascular diseases, dermatology cases (eczema, urticaria, dermatitis), E.N.T. cases (sinusitis, otitis media, external otitis, allergic rhinitis). He is adept in handling emergency cases, M.I, angina, chest pain, asthma, COPD, renal colic, intestinal colic, acute gastroenteritis, food poisoning, acute appendicitis, trauma, bone injury and suturing of cut wounds. He has attended several conferences including Arab Health in Dubai, Gulf Thoracic conference in Dubai, Paediatric and Neonatology conference, University of Sharjah, Hepatology and liver disease conference, Cairo, Cardioalex conference, Alexandria, Egypt. He is also a member of the Emirates Medical Association. Dr. Al Sayed is well versed in English and Arabic.